Anybody who has gone through the process of learning to drive, knows that it can be a nerve-racking experience. Sometimes though certain footage emerges which showcases such gross-ineptitude that it becomes a viral hit. This South-Korean video showcases one such occasion. Watch as this South-Korean driving lesson goes horribly wrong – just seconds into the lesson. 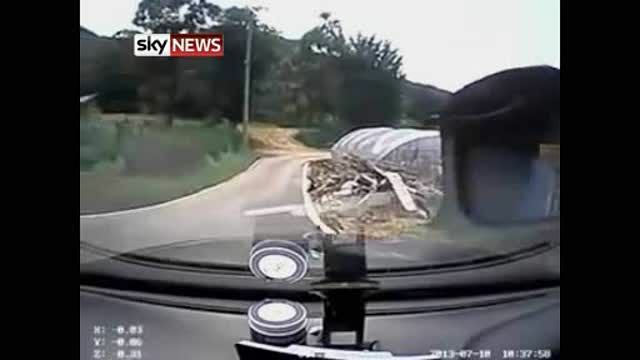 The car was fitted with a dashboard camera, and shows the car slowly travelling down a country road. With a large bank approaching, the driver inexplicably accelerates rather than breaking, leading to the car flipping upside down. With the bank approaching, the driving instructor is heard screaming at the learner to ‘brake!, brake!’ in Korean, but it’s painfully late, as the car veers up the bank and flips over. The video is fast becoming a viral hit, with over half a million YouTube hits scored in a day. Next articleQuick advice: Should I get 4G?